Tackling homophobia and racism with a focus on Central and Eastern Europe! Place homophobia and racism offside! 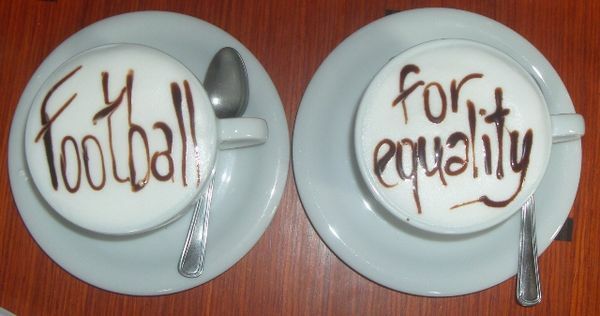 About the EU funded project "Football for Equality – Tackling homophobia and racism with a focus on Central and Eastern Europe"
In November 2009 several organizations throughout Europe started the project “Football for Equality – challenging racism and homophobia across Europe”. Thanks to a new funding of the European Commission (DG Justice) this successful project is continued since 1 June. This emphasis again is on the promotion of football free from homophobia, racism and ethnic discrimination this time focussing especially on Central and Eastern Europe. In addition to awareness raising activities, exchange of know-how and transfer of knowledge between Central and Eastern Europe and between LGBT (Lesbian/Gay/Bisexual/Transgender) groups, migrants and ethnic communities are at the fore. Awareness raising on discriminatory practices, discourses and stereotypes focussing on the ongoing discrimination of gay and lesbian and the exclusion of migrants and ethnic minorities, especially Roma people. Promotion of the approach to establish sport as means for fostering equal rights and intercultural dialogue mainly amongst stakeholders in football (clubs, associations, fans, players unions, ... ). With regard to equal rights and opportunities of LGBT persons exchanging of good practice initiatives, knowledge and educational tools between new and old Member States of the European Union. Establishing of structures for a European network and enhancing the expertise and competences of grassroots organizations, fan organizations, LGBT groups and Roma people. Measures that are implemented to achieve these objectives are quite versatile and aim at various target groups: migrants, ethnic minorities, LGBT groups, fans, people interested in football, stakeholder like players, representatives of clubs and associations, trainers and referees: The Italian project partner UISP is going to organise a wide reaching campaign against homophobia in sport in Italy which already started at the beginning of July in the course of the annual Mondiali Antirazzisti (the Antiracist World Cup). Within the course of the Action Weeks against Racism and Discrimination 2011 and 2012 in Football initiatives and activities of grassroots organisations will be supported. The organization teams of these years’ EuroGames which took place in July in Rotterdam will closely cooperate with the organization teams of next years’ EuroGames in Budapest. The EuroGames is the largest LGBT sportevent in Europe. Awareness raising measures and campaigns will be implemented alongside the EURO 2012 in Poland and the Ukraine; there will be diversity trainings for the Fans’ Embassies’ staff, special FanGuides for LGBT groups and a contact point for LGBT fans, the Pride House. When on 26 June the Football World Championships in Germany started the first measure of the Football for Equality project had already been opened: the exhibition “on the other side” started at the Schwules Museum Berlin. The exhibition is running until the 25 September and deals quite controversial with football as a field of doing gender and as a social and cultural playing ground. From 6 – 10 July project partner UISP organized the 15th Mondiali Antirazzisti this time at Castelfranco, a new location. Besides the non-competitive football -, basketball- and volleyball-tournaments the program also included discussions and workshops that dealt with equal opportunities for all genders and the right to diversity and difference. And from 20 – 24 July The European Gay and Lesbian Sport Federation organization organized the EuroGames, the largest LGBT sport event, in Rotterdam. Reports, publications, texts and recommendations of the whole project can be found on this website and events are continuously uploaded. The project partners in this edition of Football for Equality are the European Gay and Lesbian Sport Federation (EGLSF, The Netherlands), Football Supporters Europe (FSE, Germany), the Institute for Sport and Development (SPOLINT, Slovenia), People Against Racism (LUDIA, Slovakia), Unione Italian Sport Per Tutti (UISP, Italy) and FairPlay-vidc (Austria). The project will end in May 2013. This action is partly funded by the European Commission (DG Justice) under the Fundamental Rights and Citizenship Programm.